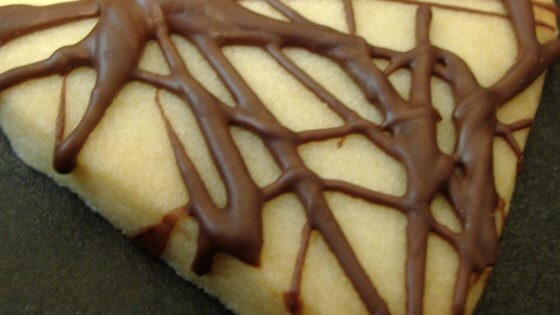 "Shortbread with chocolate. The best of both worlds." Sift together flour and cornstarch; set aside. Cream butter until smooth, then add white sugar, confectioner's sugar, vanilla, and salt; beat until fluffy. Slowly add flour mixture to butter mixture, beating on low until dough forms. On a floured surface, knead in 1/2 cup chocolate chips. Shape dough into two equal parts, pat each into a 6 inch round, and transfer to baking sheet. Cut into wedges. Bake 25 minutes. Remove immediately to cool on wire rack. Melt remaining chips and drizzle over wedges. Snowball Cookies are the perfect treat for the winter. This recipe was the best I've ever tasted! It was delicious! Very easy to make and taste great, but the dough is a bit on the dry side. I made these with butterscotch chips instead of chocolate and put the whole cup in the dough. Absolutely delicious!